14ymedio, Orlando Palma, 12 September 2015 — Tania (not her real name) is one of the 3,525 workers of the Ministry of Public Health from Camagüey who work in around 50 countries around the world. Her medical mission abroad just ended and now she is trying to readapt to her own country. However, two years away from her native province has changed this therapy and rehabilitation specialist forever. “Despite all the difficulties I had to face there, I now have the impression that I have traveled back in time,” she explains. Her stay in Venezuela was not without setbacks. Living in a poor neighborhood in Caracas, Tania had to deal with violence, food shortages and the increasing animosity among many Venezuelans against Cubans who are on official missions. Through the US program known as Cuban Medical Professional Parole (CMPP), as of 2006 a provision was implemented that allows Cuban physicians who participate in official medical missions to qualify for a visa to enter the United States. 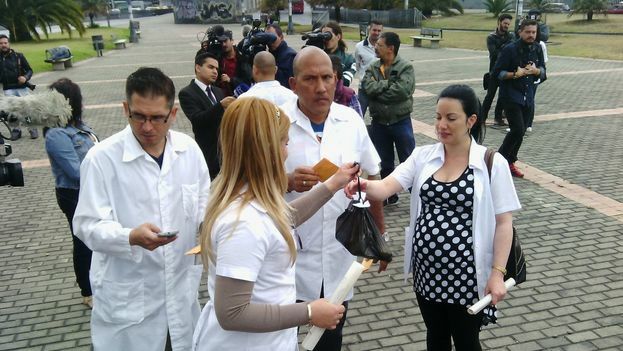 More than 720 health professionals from the island escaped from Venezuela between January and late August this year. Tania had a fixed goal in mind, “to make money to enlarge my parents’ house and have a private place for my marriage and my children,” she says. However, the money accumulated in months of hardship in Caracas was not enough to complete the long-awaited housing. “All construction materials are very expensive and we could not finish the bathroom or the kitchen.” After two years of work she managed to save the equivalent of five thousand dollars, which she brought home with her. “I had to sweat for this little piece of land,” she says. “We were in a shared house and drank instant soup almost every day,” she says of her life in Caracas. “All I bought was something to bring to my children, a flat-screen television and a laptop for the older one.” To achieve this she had to “give up many necessities. We lived like dogs in a shelter, on top of each other, without any privacy,” she remembers. As a health professional who participated in Barrio Adentro, now she gets a discount on products she buys in stores in convertible currency. “It can reach 10 or 15 percent off, particularly for soft drinks and beer.” So the specialist in rehabilitation therapy and is now dedicated to reselling drinks to families who are organizing wedding parties or quinceañeras (girls’ fifteenth birthday parties). Everyone wins.